THE project to understand the human genome has long promised to revolutionise the way that diseases are diagnosed, drugs are designed and even the way that medicine is practised. An ability to interpret human genetic information holds the promise of doing everything from predicting which drugs will work on a particular patient to identifying a person’s predisposition to develop diseases. 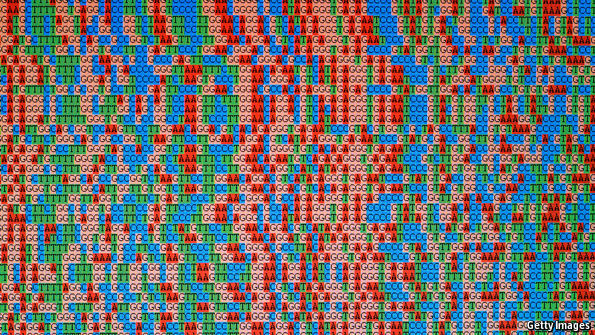 Genomic information is already transforming some medical practices. Sequencing has changed the way that fetuses are screened for Down’s syndrome, from a risky invasive test to one where abnormalities in fetal DNA can be picked up from blood drawn from the mother. In time this sort of method will extend to other genetic disorders and other medical applications. One area of promise is treating some types of cancer. Using blood tests to detect genetic changes in tumours could allow doctors to discover more quickly when drugs are no longer effective. This is so promising that there is already speculation that performing such “liquid” biopsies could be a $11 billion business by 2022.